Heat oven to 350ºF (325ºF for dark or nonstick pans). Place miniature paper baking cup in each of 58 mini muffin cups. Make cake batter as directed on box. Fill muffin cups 3/4 full (about 1 heaping tablespoon each). Bake 10 to 15 minutes or until toothpick inserted in centre comes out clean. Cool in pans 5 minutes. Remove from pans to cooling racks. Cool completely, about 30 minutes. Spoon frosting into medium bowl. Stir in icing sugar and desired food color, mixing to blend completely. Fit an open star tip (#18) on a pastry bag, and fill with frosting. On each cupcake, pipe 6 lines from the center of the cupcake, out to the edge, making an evenly spaced "spoke-like pattern" on each. With the same tip, start in the centre and make a loop by going down one side of each spoke, turning at the edge of the cupcake and following the next spoke back into the centre. Repeat ending with 6 loops. Place black gummy raspberry in centre of each cupcake. Place 2 sheets of tissue paper inside pail. Cut dry oasis to fit inside pail. Thread wooden skewer through green licorice. Thread spearmint leaf on skewer and then cupcake. Repeat to make 6 additional flowers. Arrange flowers in pail. Place remaining cupcakes on platter. Store loosely covered. 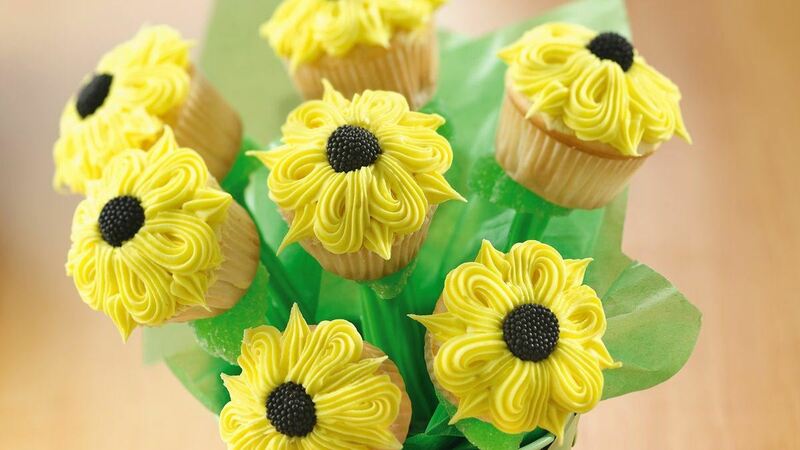 Tip: We used seven of the cupcakes to make a cute bouquet and arranged the remaining cupcakes on a large platter. If you like, make additional bouquets and use as centerpieces for individual tables. Tip: If you have only one pan and a recipe calls for more cupcakes than your pan will make, cover and refrigerate the rest of the batter while baking the first batch. Cool the pan about 15 minutes, then bake the rest of the batter, adding 1 to 2 minutes to the bake time.